Night #1 at the Viaduct went rocktastically well. We are insanely grateful for everyone who made it out to support us and for our awesome opening group, Chicago Tap Theatre. They kicked off the show (they also tapped, shuffled, and ball-changed it) with an great set of choreographed and improvised numbers. They even had one of us join them in their final number. Take a peek. If you like what you see there check out their show on Saturday, 7/18 at the Athenaeum Theatre. Thanks again to everyone who came out to have their faces rocked off. PLEASE NOTE: All faces were returned to their rightful owners at the end of the show, some in better condition then before they were removed. This Thursday we will be performing a brand spanking new set list for your enjoyment. 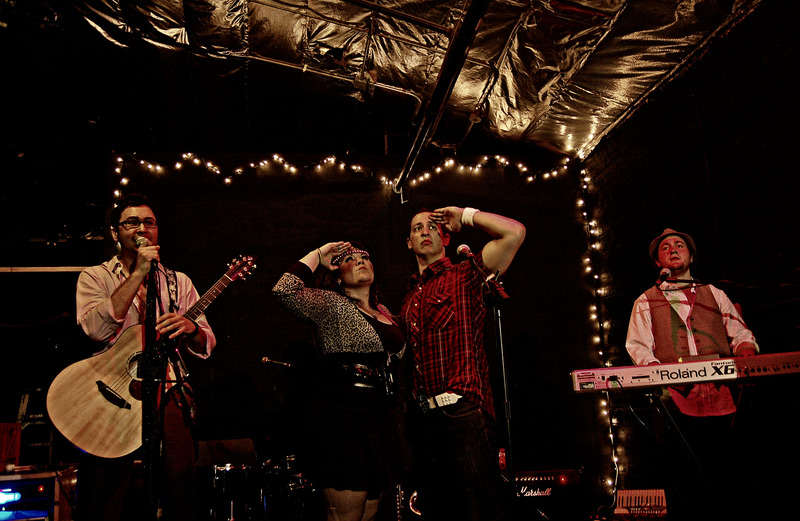 The Blue Ribbon Glee Club, Chicago’s one and only punk rock glee club opens.